A tale of love, adventure and some beans! A gruesome Giant, a wicked Witch, a fabulous Fairy, a brave Hero, the obligatory village Idiot, a daft Dame and, of course, a cute and cuddly cow! The kingdom is in trouble! Giant Blunderbore and his partner in crime, the evil witch, Poison Ivy are blackmailing the royal family, forcing them to pay protection money or else the Giant will gobble them up! All that stands between the Royals and the Giant’s dinner plate is collection of unreliable misfits! There is the dizzy Dame Trott, facing eviction from her dairy, her son Idle Jack, a day dreamer who is waiting for his destiny to find him, Dozy Den, the incompetent village idiot and the lovable cow, Buttercup (who probably has more brains than the rest of them put together!). Can this motley gang save the kingdom from destruction and beat the beastly Giant and the wicked Witch? What can Fairy Beansprout do to help them? An up-to-date, tried and tested script, jam-packed with jokes, slapstick, gunge, loveable characters and all the magic of traditional pantomime with enough audience participation to leave you hoarse by the end of the show! 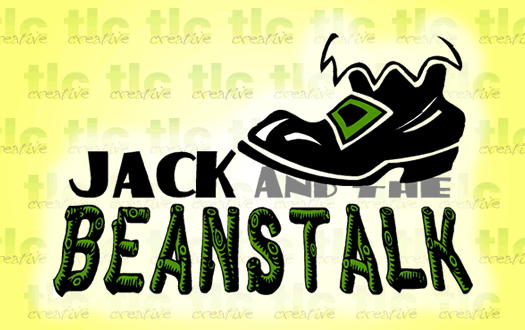 ‘Jack and the Beanstalk’ proved to be a huge hit with audiences and cast members alike. For the audience there were all the traditional elements a panto should have; plenty of audience participation, baddies to boo, heroes to cheer, masses of really bad jokes and gags, flour and a very infectious song about a moo-cow! And for the cast it was great fun with parts of all sizes(!) and plenty for the chorus to do. A GIANT of a show! Our production of ‘Jack and the Beanstalk’ went down really well. We had full houses all through the run and everyone seemed to enjoy it. Of course it helped that we had a good script to start off with, which is down to you!